Just too many blogs start up every month yet the total number of blogs on the internet stays more or less the same. The fact is blogging is no easy game. Most of the blogs don’t survive past their first 3 months. Many bloggers just get bored, run out of motivation or simply find something better to do. I’ve been here for a while now and here’s a few things I’d suggest you to keep you motivated and continue blogging. Remember the initial results can be pitiful. But also remember your blog had nothing to loose when it started. Or any traffic tracking service for that matter allows you to know more about your visitors. The traffic is a big motivation factor. The first day you started you had none. And if you have updated your even once every week you’d witness gradual traffic growth. You’d be happy to see someone out there visited your site. There are services that allow you to track your live visitors and you can see in real-time who is visiting which of the pages on your site. Not that much a utility but it definitely would keep you hooked onto the results. This is the biggest motivation factor for bloggers so much so that some have even started creating and selling posts. Adsense is just a name but in the larger sense it is all and any money that changes hands. If you are doing it right within no time you’d grow from a few cents a day to several dollars. I call it ego search. Check out if your site is making any news in the cyberworld. Remember there’s nothing called negative publicity. Again, a part of Google Search, Google will allow you to search for incoming links to your site. Doesn’t it feel great to know someone is referring to you in this big lonely world? If there’s only one, that would be you. If there are more that’s reason to be glad about. Tomorrow one may leave but it is still better than one. Technorati allows you to search within blogs and subscribe to the feed of these results. Subscribe to the feed of search results of your name. These are the bloggers getting familiar with a new blogger on the ramp. Sweet, someone cared to leave a comment. See my other post Websitegrader: How to ‘grade’ your website . This thing gives you many stats about your blog. The best part is they’re always better than what they were on day 1. Love your site and design and your work. Lastly it is up to you to love what you are doing. Love your posts, your blog design, your visitors comments and all the works. If there’s something that you are not happy about, attempt to fix it than calling quits. I’m sure there’s more to it than I’ve mentioned. 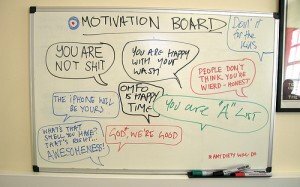 Share your motivation factors here. I log these blogging tips on this website they are really great tips for people who have blogs.